The Boys are back! Well, one of the boys … The Broadway Boys’ founder and artistic director, Jesse Nager is back in town – this time with a show of his own! Jesse Nager is joined onstage by Andrea Canny … two of your Cabaret Favorites together at last! A veteran of several Broadway shows and national tours, Jesse will sing all the best songs from these iconic shows — that belonged to other characters. The performance will feature music from Mary Poppins, Mamma Mia!, Good Vibrations, and many more. No stranger to Orlando audiences after three appearances with the Broadway Boys, Jesse goes it alone with Songs I didn’t Get to Sing. 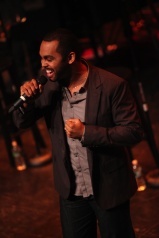 Jesse has sung with Mariah Carey, Shania Twain, and Jason Mraz and is also a member of the Broadway Inspirational Voices. Jesse is the artistic director of the Broadway Boys, a collection of New York tenors that add elements of pop/gospel/funk to traditional musical theater repertoire. The more you see, the more you save! Learn about our package deals. Tickets are limited. Please call the Mad Cow Theatre box office at 407.297.8788 to reserve your tickets. Not applicable with any other special offer or discount. Offer only applies to performances listed above while supplies last. For more information about The Orlando Cabaret Festival visit our website at orlandocabaret.com. Due to the nature of live theatre, all artists, schedules and programming are subject to change. We regret any inconveniences. This entry was posted in Cabaret, Orlando theater, Theater festivals and tagged andrea canny, Broadway theatre, Jesse Nager, mad cow theatre, orlando cabaret festival, Orlando Florida. Bookmark the permalink.